Berkeley, Calif. — With emerging exascale supercomputers, researchers will soon be able to accurately simulate the ground motions of regional earthquakes quickly and in unprecedented detail, as well as predict how these movements will impact energy infrastructure — from the electric grid to local power plants — and scientific research facilities. An interdisciplinary team of researchers from the Department of Energy’s (DOE’s) Lawrence Berkeley (Berkeley Lab) and Lawrence Livermore (LLNL) national laboratories, as well as the University of California at Davis are building the first-ever end-to-end simulation code to precisely capture the geology and physics of regional earthquakes, and how the shaking impacts buildings. This work is part of the DOE’s Exascale Computing Project (ECP), which aims to maximize the benefits of exascale — future supercomputers that will be 50 times faster than our nation’s most powerful system today — for U.S. economic competitiveness, national security and scientific discovery. “Due to computing limitations, current geophysics simulations at the regional level typically resolve ground motions at 1-2 hertz (vibrations per second). Ultimately, we’d like to have motion estimates on the order of 5-10 hertz to accurately capture the dynamic response for a wide range of infrastructure,” says David McCallen, who leads an ECP-supported effort called High Performance, Multidisciplinary Simulations for Regional Scale Seismic Hazard and Risk Assessments. He’s also a guest scientist in Berkeley Lab’s Earth and Environmental Sciences Area. In preparation for exascale, McCallen is working with Hans Johansen, a researcher in Berkeley Lab’s Computational Research Division (CRD), and others to update the existing SW4 code—which simulates seismic wave propagation—to take advantage of the latest supercomputers, like the National Energy Research Scientific Computing Center’s (NERSC’s) Cori system. This manycore system contains 68 processor cores per chip, nearly 10,000 nodes and new types of memory. NERSC is a DOE Office of Science national user facility operated by Berkeley Lab. The SW4 code was developed by a team of researchers at LLNL, led by Anders Petersson, who is also involved in the exascale effort. With recent updates to SW4, the collaboration successfully simulated a 6.5 magnitude earthquake on California’s Hayward fault at 3-hertz on NERSC’s Cori supercomputer in about 12 hours with 2,048 Knights Landing nodes. This first-of-a-kind simulation also captured the impact of this ground movement on buildings within a 100-square kilometer (km) radius of the rupture, as well as 30km underground. With future exascale systems, the researchers hope to run the same model at 5-10 hertz resolution in approximately five hours or less. This work was published in the Institute of Electrical and Electronics Engineers (IEEE) Computer Society’s Computers in Science and Engineering (https://www.computer.org/csdl/mags/cs/2017/05/mcs2017050027-abs.html). Historically, researchers have taken an empirical approach to estimating ground motions and how the shaking stresses structures. So, to predict how an earthquake would affect infrastructure in the San Francisco region, researchers might look at a past event that was about the same size — it might even have happened somewhere else — and use those observations to predict ground motion in San Francisco. Then they’d select some parameters from those simulations based on empirical analysis and surmise how various buildings may be affected. The team’s most recent simulations at NERSC divided a 100-km x 100-km x 30-km region into 60 billion zones. By simulating 30 km beneath the rupture site, the team can capture how surface-layer geology affects ground movements and buildings. Eventually, the researchers would like to get their models tuned up to do hazard assessments. As Pacific Gas & Electric (PG&E) begins to implement a very dense array of accelerometers into their SmartMeters — a system of sensors that collects electric and natural gas use data from homes and businesses to help the customer understand and reduce their energy use — McCallen is working with the utility company about potentially using that data to get a more accurate understanding of how the ground is actually moving in different geologic regions. He notes that the current seismic hazard assessment for Northern California identifies the Hayward Fault as the most likely to rupture with a magnitude 6.7 or greater event before 2044. 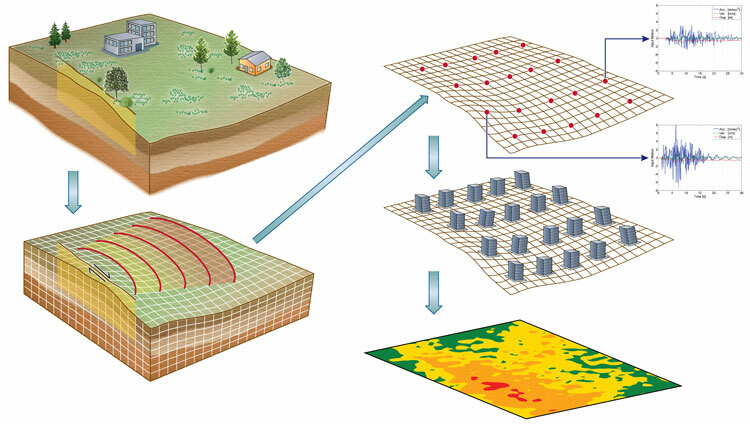 Simulations of ground motions from large — magnitude 7.0 or more — earthquakes require domains on the order of 100-500 km and resolution on the order of about one to five meters, which translates into hundreds of billions of grid points. As the researchers aim to model even higher frequency motions between 5 to 10 hertz, they will need denser computational grids and finer time-steps, which will drive up computational demands. The only way to ultimately achieve these simulations is to exploit exascale computing, McCallen says. This work was done with support from the Exascale Computing Project, a collaborative effort between the DOE’s Office of Science and National Nuclear Security Agency. NERSC is a DOE Office of Science User Facility.